Neil Liffen, Director of East Coast Physio, discusses a common soft tissue injury to the elbow. It is a misconception that to have tennis elbow, also known as lateral epicondylitis, you have to play tennis! Tennis elbow is a common musculoskeletal condition and it’s estimated that as many as one in three people have tennis elbow at any given time. Each year in the UK, about five in every 1,000 people go to see their GP about tennis elbow with a recurrence rate within 2 years was 8.5%. The condition usually affects adults and is more common in people who are 40-60 years of age with men and women are equally affected. Tennis elbow is an ‘overuse phenomenon’ related to people who perform repetitive activities e.g. gripping and lifting, either at work and/or during recreational pursuits. Unfortunately, there is not the perfect job and most jobs involves a repetitive loading element. In tennis elbow, this repetitive strain causes over loading (stress) to a tendon located around the lateral (outside) elbow, called the common extensor tendon (CET). The CET inserts into a bony region called the lateral epicondyle of the Humerus (long upper arm bone). 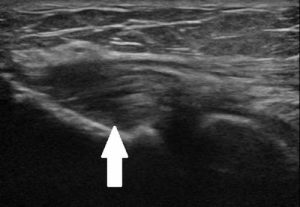 On ultrasound a normal CET has a regular linear appearance (Figure 1), but in tennis elbow abnormalities of the CET can occur. In Figures 2-4 we demonstrate some of these abnormalities. Figure 2. Thickening of common exetnsor tendon (tendinopathy). Figure 3. 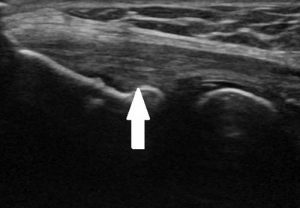 Ultrasound of a partial tear of the common extensor tendon. Figure 4. Calcification of the common extensor tendon. Figure 1. 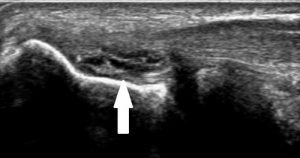 Normal common extemnsor tendon on ultrasound. verey same niche as yours and my visitors would genuinely benefi from some of the information you present here. Please let me know if this alright witth you. Many thanks! I needs tto spenmd some time learning more orr understanding more. You should take part in a contest for one of the mst useful websites on the net.